JOHN 11:26 KJV "And whosoever liveth and believeth in me shall never die. Believest thou this?" 23Jesus saith unto her, Thy brother shall rise again. 24Martha saith unto him, I know that he shall rise again in the resurrection at the last day. 25Jesus said unto her, I am the resurrection, and the life: he that believeth in me, though he were dead, yet shall he live: 26And whosoever liveth and believeth in me shall never die. Believest thou this? 27She saith unto him, Yea, Lord: I believe that thou art the Christ, the Son of God, which should come into the world. 28And when she had so said, she went her way, and called Mary her sister secretly, saying, The Master is come, and calleth for thee. 29As soon as she heard that, she arose quickly, and came unto him. And whosoeuer liueth, and beleeueth in mee, shall neuer die. Beleeuest thou this? and every one who is living and is a believer in me shall never, never die. Do you believe this?" he schal lyue; and ech that lyueth, and bileueth in me, schal not die with outen ende. Bileuest thou this thing? 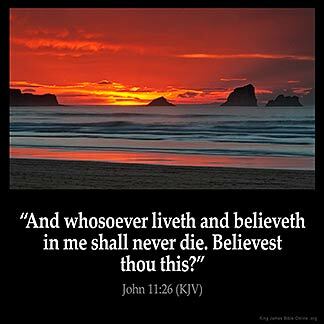 Joh 11:26 Whosoever liveth and believeth in me shall never die. Those dead, who believed in him, shall be raised and live, and those living who believe, shall never perish. Death will only be a change to a better existence. Jesus is saying I am the Resurrector, the One who raises the dead back to life. I am the Source of all life. If you believe in me like Lazarus did I will also resurrect you from death to eternal life. If you believe in me and know that I am the Son of God then then you have assurance of eternal life with me in God 's Kingdom. Do you know that resurrection is not a place, thing, event or a time. Resurrection is a person and his name is JESUS! If you received grace , salvation, hope, faith then you need to receive that part that will resurrected you unto a new life. I love King James Bible, sometimes I read the New, too. God Bless you.